The fortress of Basilia is located on the northeastern part of Mirror Lake, surrounded by wild nomads and herds of Centaurs, and is constantly threatened by creatures from the nearby Land of the Dead. This huge settlement is one of the few fortified towns in the Great Plain that is inhabited mainly by humans. In earlier times Basilia was a haven for criminals and villains from all over the world who had no fear of extradition because of its strict neutrality. But over the past 100 years the picture has changed. This is thanks to the city’s fire-and-earth Elementalist Vasiliki. Exactly 100 years ago she invented the fire glass, which now has become hugely popular. Vasiliki finally died 10 years ago after her 15th revival. A statue of her fire glass invention is in the center of Basilia’s main market plaza. Only her students know how to make a fire glass. When someone holds the fire glass for the first time, perhaps they may be frightened due to its warm pulsation. Upon looking at it more closely, it seems there is a flame caged in glass, flickering slowly – as if it is a Palantian rocking dance. Yellows, oranges and reds that are pleasing to the eye can keep the viewer fascinated for hours – therefore in every wealthy household you can now find at least one fire glass. Since the processing is very difficult to learn, Basilia has its own stone-and-glass masons, and the great fire glass factory ‘Vasiliki’s Firebloom’ has a global monopoly for the production and handling of fire glass. And so former criminals and villains of the past few decades are now young stonemason apprentices in Basilia, hoping to learn the difficult craft of fire glass processing. The city is in full bloom. Were it not for the high cost of the military and the mercenaries, none of the inhabitants of Basilia would live in poverty anymore. 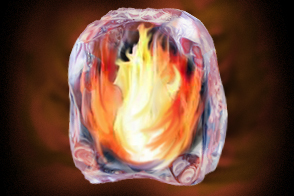 Often Wolfen merchant ships head peacefully over the Amrun toward Basilia, showing the great popularity of the city both as a trading center as well as a supplier of fire glass, one of the most sought after materials worldwide.